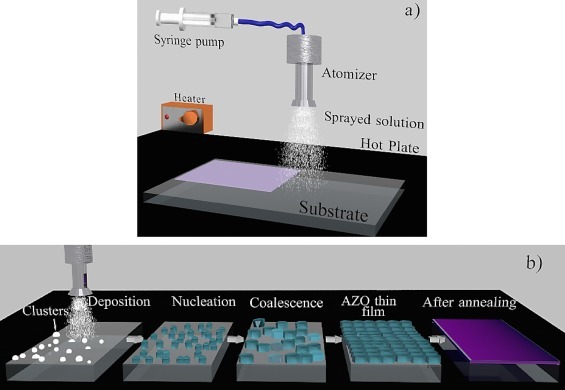 Ultrasonic spray pyrolysis deposition of ZnO-based materials offers an attractive high-throughput low-cost route towards industrial production of high-quality transparent conductive oxide (TCO) thin-films. In this work, undoped and aluminium-doped ZnO films have been grown employing ultrasonic spray pyrolysis at relatively low-temperate (300°C), followed by a post-annealing treatment. The role of Al concentration in the starting solution, as well as the rapid thermal annealing (RTA) atmosphere, were investigated and correlated to the morphological, structural, electrical and optical properties of the films. The remarkable enhancement of electrical conductivity attained here is mainly ascribed to the combined effects of: (1) homogenous incorporation of Al3+ into the ZnO matrix, which enhances crystal quality providing higher electronic mobility; and (2) the RTA which releases the localized electrons caused by oxygen absorption and thereby increases the free carrier density. Under optimum deposition conditions, a low resistivity and a high optical transmittance around 4×10−3Ωcm and 87%, respectively, were obtained. The application of the RTA post-process after low temperature growth has several advantages relative to the direct growth at high temperature (usually 400–575°C), such as shorter growth time and lower cost associated to the spray pyrolysis equipment requirements and usage. The results suggest that the electrical and optical properties of the ZnO:Al films can be further improved for solar cell applications by controlling the temperature of the post-deposition annealing in reducing atmosphere.